Rocketry | Propulsion Sub-team – A.S.A.T. *according to thermodynamic analysis at the maximum chamber pressure and the specific F/O ratio. Motor casing, Solid Propellant Grain, Inhibitor, Thermal Insulation, Nozzle, Igniter Casing Bulkhead, O-rings. 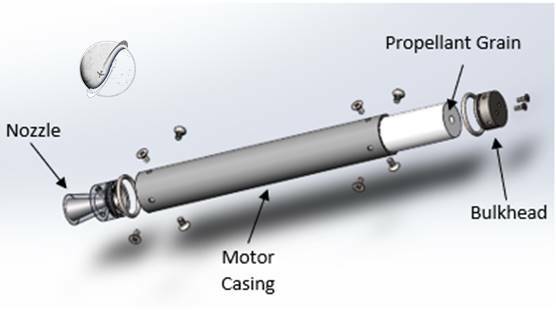 The motor casing is made of aluminum alloy, which is a lightweight material, and it is selected for the casing of the propellant to withstand the maximum operating pressure. The casing is protected from the combustion temperature and the exhaust gases with the thermal insulator. Our solid propellant consists of Potassium Nitrate (KNO3) which serves as the oxidizer and Sorbitol as the fuel. These ingredients are mixed in an optimized F/O (fuel/oxidizer) ratio. Our propellant grain is cartridge-loaded, which means the propellant is manufactured separately from the case. The propellant is casted into the cylindrical mold to take the desired configuration and then it is assembled into the casing. The outer diameter of the mold serves as the inhibitor. The inhibition protects the external surface of the grain from burning thus we can determine more accurate the internal ballistics of the motor. 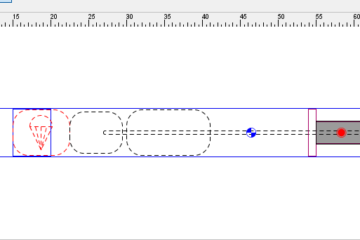 The cylindrical grain configuration, in which the internal cross-section geometry remains constant along the motor, is selected because it is easier to predict the performance parameters of the motor. So, according to this grain design, it results in a progressive Thrust v Time profile as we can see from the figure below. Progressive profile means that the Thrust increases with time. To prevent gas leakage from the casing we use an o-ring sealing system. Finally, for the proper ignition process, the pyrogen igniter and the ignition powder are placed near the upper bulkhead. The ignition powder we use is black powder. Both the propellant and the black powder are handled in accordance with the safety rules by the Material Safety Datasheet for each ingredient and according to the Safety Rules for Handling and Manufacturing Propellants and Explosives. We perform static tests of the motors to validate the theoretical design performance parameters. These performance parameters are listed in the solid rocket motor’s and combustion characteristics (Table 1). 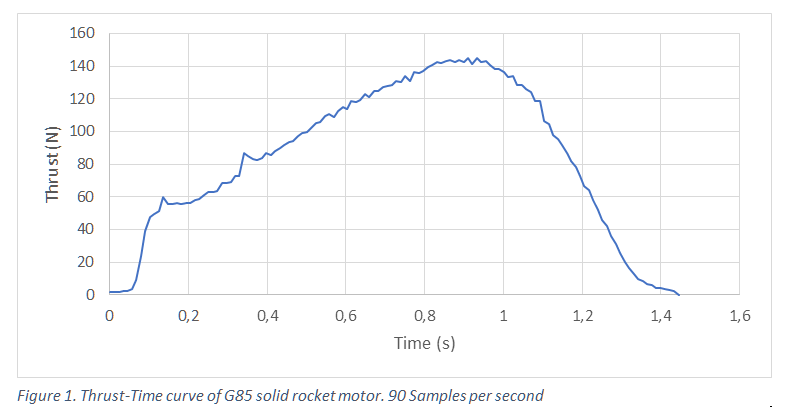 All the parameters’ values were acquired with a loadcell set-up and we log data with a frequency of 90 measurements per second. So far, we have performed 22 static tests, 18/22 successful. The unsuccessful tests led two times in the destruction of the loadcell set-up and so we had to rebuild. The static tests failures were due to insufficient propellant inhibition, excessive black powder amount and/or cracks in the propellant grain developed from the casting process which led to increased pressure in the combustion chamber and explosion. 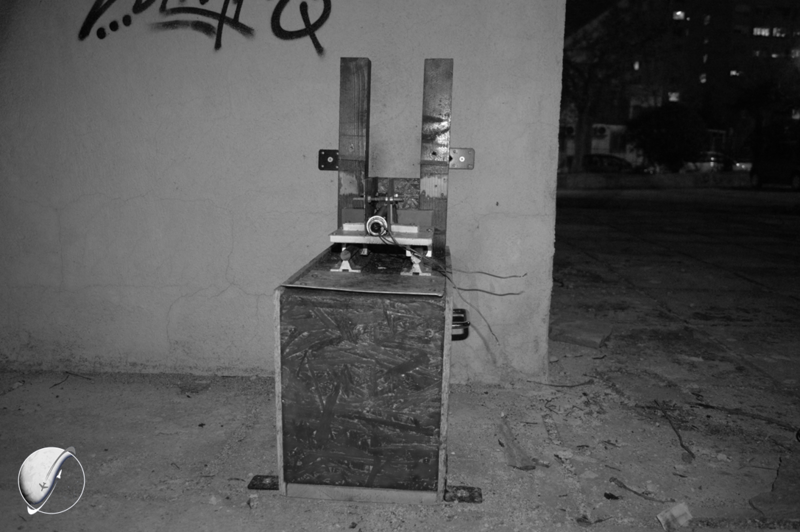 Through the static tests we achieved reliability of the motor and consistency of the measurements. 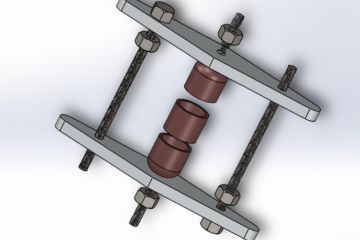 We validate the theoretical design results and static test measurements with the flight data. 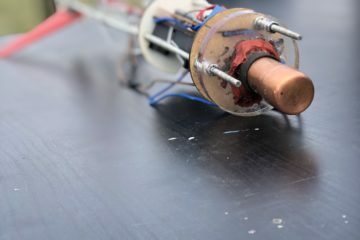 We are now in the process of scaling-up the rocket motor which is more complex because of the more demanding mission requirements.